Lexus has drawn inspiration from the shimmering blue of a butterfly’s wings to develop a striking exterior paint that is being made available for the first time in Australia on a new, special version of the LC flagship coupe. The exclusive LC Limited Edition, available in both V8-powered LC 500 and self-charging hybrid-electric LC 500h versions, features a dazzling, iridescent new shade of blue that takes vehicle colour to a new level. Called Morphic Blue, the new pigment is the result of 15 years of painstaking advanced technology research by Lexus to develop a finish that is deeper, more lustrous and more “blue” than anything seen before. It was inspired by the shimmering blue wings of the American Morpho butterfly and incorporates 300 billion nano-structure (super-small) pigment flakes that generate iridescence, giving the impression of the colour constantly changing with the light. The exquisite quality of the ground-breaking paintwork is matched by a bespoke luxury cabin presented with a Chrysalis Blue colour scheme that combines dynamic orange, blue and white hues and features the use of high-quality materials including semi-aniline leather accents and Alcantara®. The exclusivity of the LC Morphic Blue Limited Edition is also reflected in the fitting of carbon-fibre scuff plates. 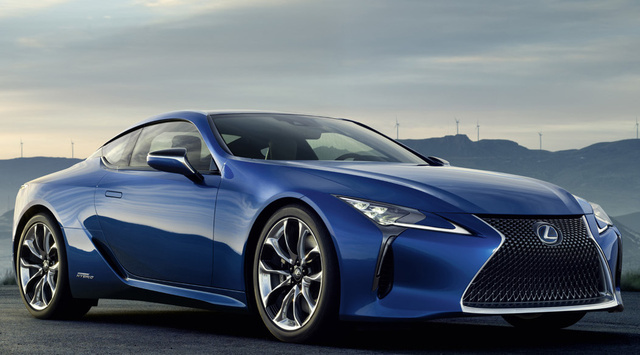 Lexus Australia chief executive Scott Thompson said the Morphic Blue paint ensures the special LC coupe stands out from every other car on the road. “The LC Morphic Blue Limited Edition adds extra elements of exclusivity and hand-finished quality to the brand’s sensuously designed coupe,” Mr Thompson said. “Offered in extremely limited numbers, this will be the car of choice for those who recognise and value the interaction of science and the highest standards of Lexus Takumi craftsmanship,” he said. The pigment used for the Morphic Blue paint is the result of an eight-month process that includes 12 production steps and 20 quality inspections. It is applied in seven layers, making it practical for use in the production of highly exclusive cars such as the LC 500 and LC 500h Limited Edition. Conventional pigment paints reflect less than 50 per cent of incoming light as a visible blue colour, but with Morphic Blue the level is nearly 100 per cent. Such is the fine quality of the process, only two Morphic Blue cars can be produced in a working day at Motomachi factory in Japan, the high-technology home of the LC. While the Morpho butterfly is renowned for the stunning blue of its wings, they are, in fact, colourless. The blue seen by the human eye is created by light interference on the microscopic lattice surface structure of the butterfly’s wings. Similarly, Morphic Blue paint is designed to work on the eye rather than on a camera lens; it is only when it is seen “in the flesh” that the amazing effect becomes clear. The recommended retail price is $192,500* for both the LC 500 and LC 500h Limited Edition models, representing a premium of $2,500 for the painstakingly developed and applied paint and the bespoke interior.